Make a bold statement with the Kitchen Faucet Combo, featuring the Mateo Series. The Pull Down Faucet has clean lines and a sleek design, with a coordinating Bar/Prep Faucet for a balanced modern look. Both faucets feature best-in-industry components, and are designed with QuickDock assembly for easy top-mount installation. This combo comes with a matching soap dispenser. Experience Kraus Quality and outfit your kitchen in seamless style. Allentowns design is a modern take of industrial design. The textured patterning on the base and spray wand add an attractive detail that is easy to keep clean. Allentown also comes with Deltas Spotshield Technology finish that helps reduce stain and odor-causing bacteria growth on the faucet surface and resists water spots, fingerprints and stains so the faucet stays cleaner longer. The pull-down spray wand comes free with a gentle tug and as you raise the wand to dock it, the magnet embedded in the spout pulls the wand precisely into place. Only Delta faucets are equipped with Touch-Clean<sup></sup> soft, rubber nubbins that allow you to easily wipe away calcium and lime build-up with the touch of a finger. Also, Allentown comes with an escutcheon plate so you can cover up extra holes on your counter or sink for a finished look. The Delta Grenville kitchen collection's minimalist arches and curves provide a nature-inspired look that completes today's modern aesthetic in the kitchen. The beautiful stainless finish elegantly upgrades the kitchen and compliments both stainless and black appliances. The high arc allows for tall vases and pots to easily fit into the sink for filling. The pull-down spray wand provides lots of extra reach for convenience. An ergonomic toggle allows for switching from stream to spray and helps make cleaning up a breeze. You can install with confidence, knowing that Delta faucets are backed by our Lifetime Limited Warranty. The Glacier Bay Upson Pull-Down Kitchen Faucet in Matte Gold features an elegant, modern style design that will compliment a variety kitchen dicor. Its single lever handle meets ADA standards for ease of use in adjusting water temperature and volume. The pull-down sprayer features an aerated and full spray pattern. The sprayer also includes an extended reach, making it ideal for filling large pots and pans or washing down the sink. Mateo Pull Down Kitchen Faucet With Bar/Prep Faucet & SD Stainless Steel Make a bold statement with the Kitchen Faucet Combo, featuring the Mateo Series. The Pull Down Faucet has clean lines and a sleek design, with a coordinating Bar/Prep Faucet for a balanced modern look. 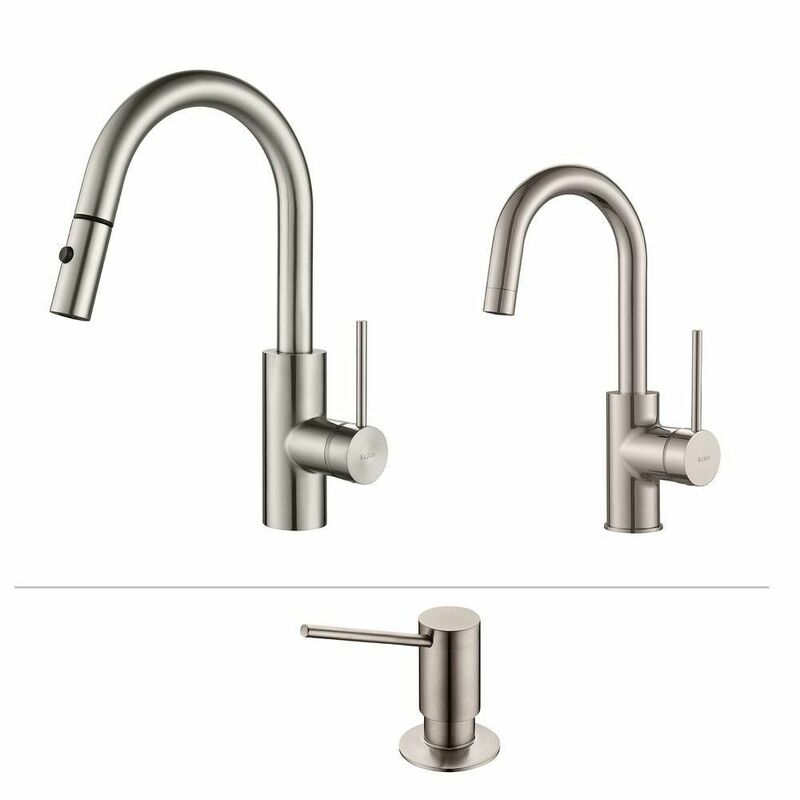 Both faucets feature best-in-industry components, and are designed with QuickDock assembly for easy top-mount installation. This combo comes with a matching soap dispenser. Experience Kraus Quality and outfit your kitchen in seamless style. Mateo Pull Down Kitchen Faucet With Bar/Prep Faucet & SD Stainless Steel is rated 4.7 out of 5 by 21. Rated 5 out of 5 by Cher from High Quality Gorgeous Faucet! Extremely satisfied with purchase. It is stunning. So pleased bought second Kraus facet for bar sink same room. Rated 4 out of 5 by Arrrdubb from Nice Faucet Love the modern look of this faucet and nice price. Product has been installed for 3-4 months and quality seems good. I wish there was some resistance/ stiffness in the swing arm. Rated 5 out of 5 by TDoan from Kitchen Faucet I am always use KRAUS product, very satisfy it replace my old KRAUS Faucet (9 yrs old). Only wish the button at the prayer can hold by itself like my old one, this one you have to push that black button and hold it when you spray. Other than that its beautiful and easy to install, this actually the gift from my son for Christmas. Rated 5 out of 5 by BLC from SS undermount kitchen sink, faucet, dispenser HIGH QUALITY AND COMPETITIVELY PRICED, JUST INSTALLED YESTERDAY SO WILL SEE PERFORMANCE OVER TIME. Rated 5 out of 5 by Dardar52 from Very high quality product Have had faucet installed now for about 2 weeks and are very pleased with its performance.